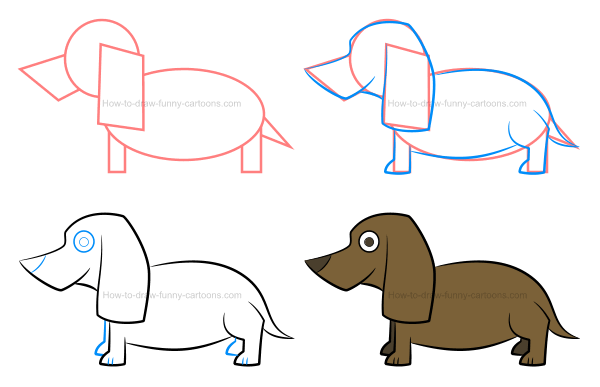 Learn how to draw an illustration of a dachshund using simple basic shapes, curved lines and plain colors and then see a few variations of the same dog using different body length. Dachshunds are fascinating animals. Featuring a long body, large ears, a pointed nose and shorts legs, these cute dogs are relatively easy to spot on the street. Small eyes and pupils drawn using circular shapes. Both ears are large and made from simple rectangles. The back of the animal is made from a long curved line. The tail is short and pointed. Back legs are short and thick on top. A long body and a solid stomach. Front legs are also short and made from curved lines. The mouth is strong and large. Cool! This drawing lesson is featuring only four easy steps, so let's see how we can draw this cartoon dachshund using a few basic shapes to start with! 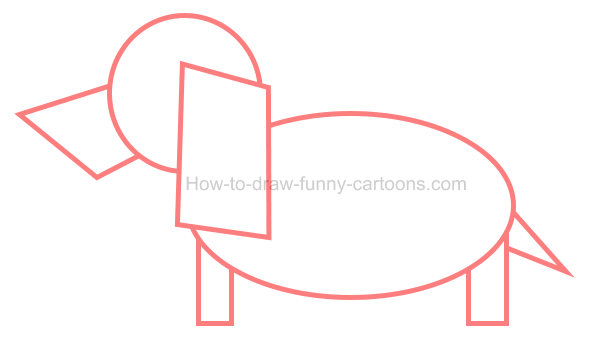 First, let's draw a simple circle to illustrate the head of the animal. 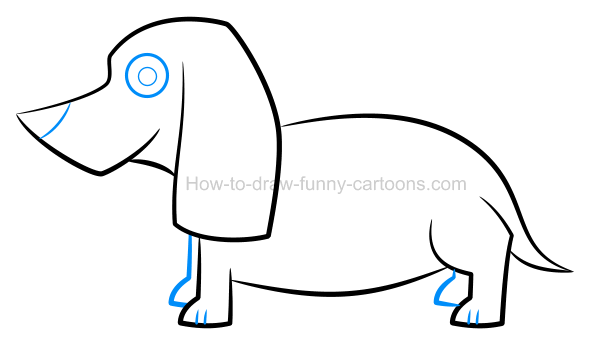 Continue working on this illustration of a dachshund by sketching the mouth and the ear using irregular rectangles. The body is made from a large oval shape and the feet are created from thin rectangles. Finally, complete this step by adding a tail made from a pointed triangle. Using mostly long curved lines, it's now time to draw the character itself. Notice how the nose must be sharp, how the body can be long and the particular shape of the back leg. Once the animal is completed (as shown above), you can remove all orange shapes created in the previous step. Indeed, these guidelines are not needed anymore. Inside the head, draw an eye and a pupil using small circles. The nose is created using a simple curved line. You can also draw two more legs using lines as shown below. Complete this third step by drawing small lines inside the feet to illustrate the paws. Excellent! Our illustration of a dachshund is now finished! This character is cute, but it can be even cuter if colors are added inside the illustration. For this example, a dark brown color was selected. Elements like the pupil, the nose and both legs located behind the cartoon character are filled with a darker version of the same color. 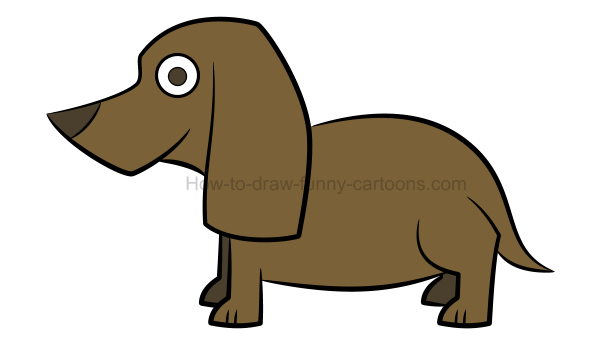 How long should this illustration of a dachshund be? 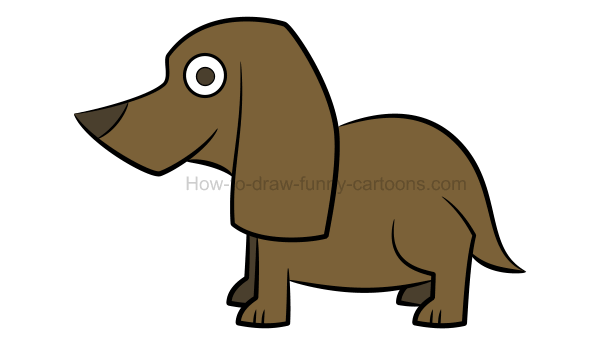 So far we have created a cute cartoon dachshund using a bunch of basic shapes, several long curved lines and plenty of brown colors. Although the length of the body is quite reasonable in this example, I am wondering how the character would look like with a shorter body and a longer one. Let's find out! Very short. It's not a dachshund anymore! 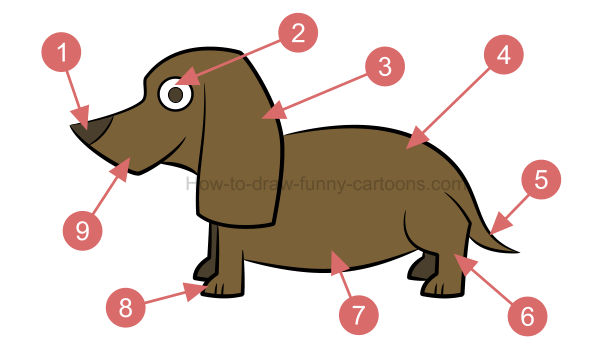 If we draw a body that is too short, then obviously this illustration of a dachshund now becomes a simple image of a simple dog. It could be recognized because of its facial features, but most people would not see a dachshund in this picture for sure. That's the price to pay to draw such a short body! In this second attempt, the body is shorter than the original version, but also longer than the previous one. It's closer to a dachshund, but I don't feel like it's convincing enough yet. I think we will need to try something even more extreme to create a beautiful dachshund. Let's add some length by making the body longer than the original version. No doubt, this dog looks like a cool dachshund. The original version was convincing enough, but this one is making a statement! Too long? not in the wonderful world of cartoons! 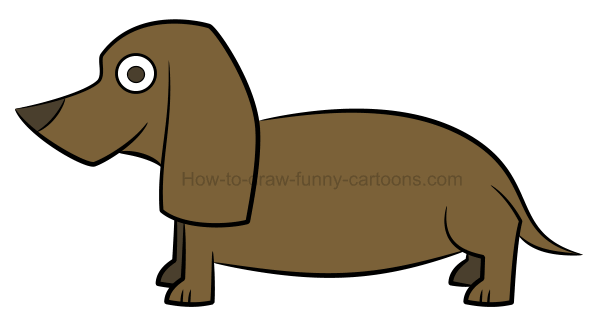 Why not exaggerate a little bit and create a very long body for this illustration of a dachshund. Sure, it's not realistic at all, but we are drawing cartoons! Anything is possible! It's useless to go beyond this size, but it's a good example that you are in control and you can draw all the versions you want to! be creative and play with all body parts! 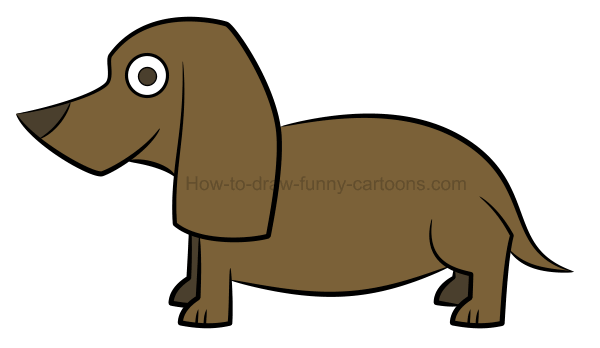 As you can see, there are no real guidelines when drawing a cartoon animal like a dachshund. Your goal is to draw something believable while playing with proportions as precisely as you can. However, since we are creating cartoon characters and not realistic images, we have all the freedom we need to sketch and draw anything we want.